The LpDAS series of products are small, lightweight, conduction cooled embedded computers for rugged environments. These customizable off-the-shelf computers have many built-in and customizable standard peripherals and interfaces for various avionics databuses as well as (cc)PMC expansion capability. With the addition of application software the LpDAS provides a readily available solution to challenging interface, bridging and control problems. The LpDAS is available in many configurations to meet a variety of needs. Typical applications for the LpDAS include inteligent remote data concentration, data and protocol conversion, data logging, active control, process and health monitoring. The LpDAS is designed to be a Portable solution for High Performance applications, both on the ground and in the air, The Low-Power Electronics, PowerPC® processor and small dimensions enable this to be achieved, making the LpDAS ideal for Avionics, Defence, Transportation and Industry. At the heart of the LpDAS, a user programmable PowerPC® processor runs the software application and controls the various standard interfaces (CAN, serial, Ethernet, Analogue and discrete) and avionic databuses (ARINC 429, MIL-STD-1553 etc.). Hardware interfaces are integrated to a high-level of functionality in FPGA in order to make full use of the processor for software application. The versatility of the LpDAS lends itself to many different applications. As an intelligent Remote Data Concentrator (iRDC), measure and process data and transmit it via AFDX. 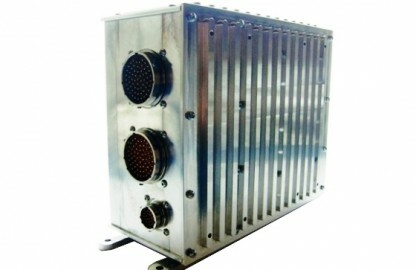 As protocol converter it can aid in the integration of commercial and military avionics. The ability to combine data acquisition with Real Time Processing offers the potential to deploy the LpDAS in Time Critical Systems, where the fast-loop processing can be performed locally without placing extreme demands on the databus. The included LpDAS Software Development Kit (SDK) provides tools and examples to facilitate the development of OS-less software applications. Optional with TCP/IP stack. On request the LpDAS can be provided with an Operating System, like Embedded Linux, VxWorks and PikeOS.